CHARLOTTE AMALIE – The patient arrived at Schneider Hospital in St. Thomas shortly after midnight on a Sunday, complaining of sharp and tearing chest pains and shortness of breath. He was sweating. Doctors diagnosed a ruptured aortic valve that required emergency open heart surgery — a procedure no hospital on island is equipped to perform. So they called the nearest medical center with the cardiac surgeons and resources to save the man’s life: Jackson Memorial Hospital in Miami. But rather than clear the patient for immediate transfer to Miami by helicopter, Jackson Memorial doctors and administrators waited while they verified his health insurance coverage and method of payment, according to a federal inspection report of the April 2014 incident. The man, whose identity is protected by law, never made it to Jackson Memorial’s emergency room. He died in St. Thomas nearly 18 hours after doctors first reached out to Jackson Memorial for help. By refusing to accept the patient without financial clearance, Jackson Memorial violated a 1986 federal law known as the Emergency Medical Treatment and Active Labor Act or EMTALA, which prohibits hospitals from rejecting patients with an urgent medical condition based on their ability to pay. The public hospital system — after a federal healthcare investigation — has since retrained its staff members, consented to monthly audits and revised the policy for accepting patients transferred from U.S. territories such as the Virgin Islands. But the reforms didn’t happen until the federal Centers for Medicare and Medicaid Services ordered Jackson to correct the deficiencies — or the agency would terminate Jackson’s license to bill Medicare, a potentially catastrophic penalty. The investigation was launched three weeks after Jackson Memorial refused to accept the patient. That’s when state health officials, acting on a complaint from doctors in St. Thomas, made an unannounced inspection of the hospital. According to a CMS report, the agency found that Jackson Memorial doctors and administrators made the man wait more than 12 hours after the initial call until health officials in the Virgin Islands could guarantee payment, even though the man received Medicaid. Even after receiving a letter of guarantee, which described the man’s condition as “life-threatening,” Jackson Memorial made him wait more — stating that the administrator in charge of approving international patient transfers did not work on the weekends, according to the report. And they gave him 10 days to make the needed changes. 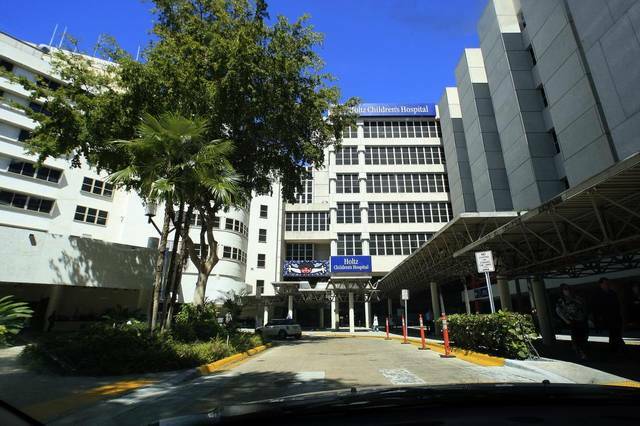 Jackson Health System, which includes flagship Jackson Memorial and satellite hospitals in North Miami Beach and South Miami-Dade, received nearly $345 million or 41 percent of its net patient revenue from Medicare in 2013, according to the most recent financial data from Florida’s Agency for Health Care Administration. Instead, Jackson Memorial stopped the policy of financial screening prior to accepting emergency patient transfers from U.S. territories and commonwealths like the Virgin Islands and Puerto Rico. No insurance, no money, no transfer. That’s a change from the practice described to investigators by the hospital’s director of international services during the unannounced inspection: “No insurance, no money, no transfer,’’ the Jackson administrator said, according to the report. In July 2014, federal healthcare officials accepted Jackson’s corrective plan and lifted the threat of terminating the hospital system’s Medicare contract. But the fact that Jackson admitted that it performed a very long financial screening of an unstable patient is “remarkable,’’ said Larry Weiss, a physician and University of Maryland professor of emergency medicine. The April 2014 incident was not the first time the hospital system was investigated for failing to heed the law, which requires hospitals to provide medical screenings and to stabilize a patient and either treat them at the hospital or transfer them to another medical center capable of caring for the patient. In October 2011, administrators at Jackson North Medical Center in North Miami Beach turned away a psychiatric patient who had been committed under Florida’s Baker Act and taken to the hospital’s ER by ambulance, according to CMS inspection records. Jackson North’s intake staff refused on the grounds that the hospital was not a psychiatric facility, but they failed to screen and stabilize the patient, who was taken to another medical center. In July 2013, federal inspectors reported that Jackson North employees again failed to medically screen and stabilize two pregnant women who had gone to the emergency room with severe abdominal pain on separate occasions in January and May. The patient who had been discharged in May had a fallopian tube removed by surgeons at another hospital about five days after going to Jackson North’s ER. Jackson did not pay fines in either of those cases. Taxpayer-owned hospital systems such as Jackson — which received nearly $400 million in Miami-Dade sales and property taxes in 2014, and millions more in state and federal public funds — have a duty to take on all comers, said Weiss of the University of Maryland. In 2013 and 2014, Jackson Health spent $29.2 million in free or reduced care for patients who arrived in its ERs. Hospitals have been prohibited from delaying or denying treatment of a person with an emergency medical condition since 1986. Only a lack of capacity or clinical expertise excuses a hospital’s emergency room from taking every patient with an urgent condition. But as the biggest public hospital in the state, treating the most complicated medical cases, and with the busiest emergency room in Florida, Jackson may bear a greater burden than any other hospital in South Florida.